A mobile product company called Pocket Scientist has just announced the unveiling of its augmented reality fireworks app that allows smartphone and tablet users to celebrate with a digital pyrotechnic display whenever they want. These displays can be viewed on the screen of the device and can be selected for specific celebrations. Some of the augmented reality fireworks that are available include New Years, romantic, and those for anniversaries. The various scenes that are available are designed to be appropriate for each different occasion. The augmented reality technology that is used for the displays is cutting edge. It helps to make it look as though the rockets and explosions that appear on the mobile devices are as real as possible. All the user needs to do is point the camera of the smartphone or tablet at the horizon, and the fireworks will appear in stunning colors and shapes. The effects are meant to be as breathtaking as the real thing. The augmented reality pyrotechnics can work in daylight, but the full effect (as with the real deal) isn’t available until darkness has fallen. The perfect view is over a city’s lights from the side of a mountain or hill. The augmented reality is used along with the camera of the smartphone or tablet. The rockets are launched into a three dimensional real time calculated space. If the camera is turned, the fireworks remain within the same virtual position and do not move along with the camera of the device. This augmented reality application’s basic version is available for free download, but it comes with the downside of a watermark within the view as well as to a photograph that is taken from the actual AR view. The watermark is removed and the full app becomes available by paying a fee of $0.99. 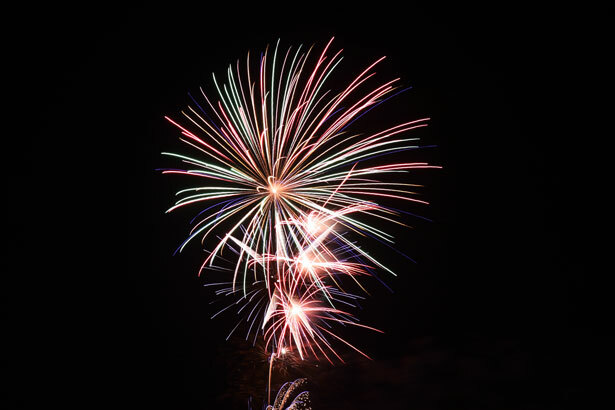 Photos of the view of the augmented reality fireworks can be shared over a user’s Facebook account, so that their friends can also enjoy the images. This adds a completely different social element to the features that are available through this application. Augmented reality is often considered to be a technology that primarily inhabits the realms of marketing and entertainment. In these two fields, the technology has become exceedingly popular. As augmented reality becomes more popular amongst consumers, retailers are beginning to see the potential of the technology beyond marketing and entertainment. A new survey from the Cardinal Group, a leading provider of shopping technology and security solutions for the retail industry, suggests that mobile commerce may soon merge with augmented reality. Augmented reality often garners acclaim because of its dynamic nature. The technology can be used to bring a wide range of digital content to life with high definition, 3D displays. Consumers have come to enjoy the technology for this reason, showing favor for mobile applications that employ augmented reality in an entertaining and practical way. As consumers become more reliant on their mobile devices, augmented reality may begin playing a larger role in the field of mobile commerce, which itself has already become rampantly popular with consumers. According to the survey from the Cardinal Group, 55% of shoppers have downloaded a mobile application onto their device, with 51% of these consumers having made a purchase through such applications at some point in their life. The Cardinal Group also employed an augmented reality mirror, called the Virtual Fashion Mirror, at a recent London event, which was used by 87% of those attending. The survey also shows that consumers are growing increasingly interested in the capabilities of augmented reality in mobile commerce. Augmented reality could potential bring a new dynamic to the world of mobile commerce. The retail industry uses augmented reality to sell products in a limited capacity through virtual fashion mirrors similar to the one used by the Cardinal Group. These applications of augmented reality have proven effective in the past, but how the technology will be incorporated into the future of mobile commerce has yet to be seen.